Posted on Thu, Apr 22, 2010 : 9:10 a.m.
Stinging nettle. Gloves are recommended. We don’t normally like to eat foods that come with warning labels. When stinging nettle, Urtica dioica, makes a rare but welcome appearance in the People’s Food Co-op produce section, it is in its own container, and it comes with directions on how to handle it - with gloves. It does sting. There are tiny hairs located along the stem and the underside of the leaves that can inject a tiny bit of formic acid into your skin. It only happens when you brush against the hairs, but the result ranges from a mild tingly sensation to an itching rash that can last hours. With so much invested in defense, you should suspect that there is something wonderful to protect. There is. 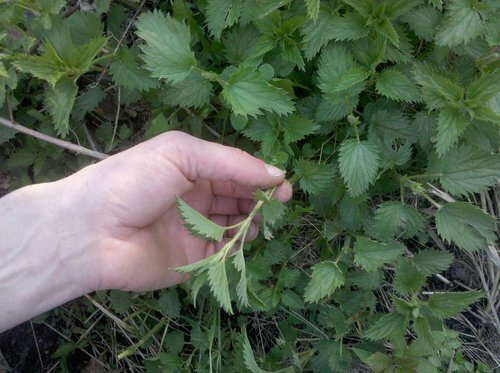 Stinging nettle is a plant rich in nutrition and medicinal value. In 1989 Susun Weed, the herbalist I apprenticed with, devoted an entire chapter of her book "Healing Wise" to nettles. Since that time, studies using Urtica have affirmed its traditional use for kidney and urinary support, asthma relief, and help with Benign prostatic hypertrophy (BPH). It is also an excellent burn remedy when used topically in a salve or oil. As a nourishing food, nettle is a significant source of protein, calcium and iron. That is why it is prized by midwives and pregnant women. It contains the nutrients needed during pregnancy. The nourishing benefits are of course best delivered by eating the nettles. Once they are steamed for 10-15 minutes they give up their defense and can no longer sting. The same is true when dried. Steamed nettles are great on their own or can be added to recipes wherever greens and especially spinach would be used. But the flavor is so lovely, rich, satisfying and whole, I would advise keeping it simple and just enjoying the plant as is. Dried nettles can be made into what is called an infusion. Compared to the minute or two that tea or tisanes are brewed, to receive the more complete nutrients from a plant you’ll want to steep it a couple of hours. I make a lot at once. In a half gallon canning jar I pour about an inch or more of dried nettle. I then add water just off the boil (water that has not yet boiled or that has boiled and slightly cooled) to totally fill the jar. Make sure and put a lid on it, and let sit two to three hours or overnight. Strain off the liquid from the plant and add the used plant material to your compost. They are an excellent addition, and students of Rudolf Steiner and biodynamic gardeners use them extensively for just that purpose. What you don’t drink, be sure to refrigerate. Because of the high protein content, the infusion will only last two to three days. The infusion can be gently reheated, served with honey, mixed with juice, enjoyed over ice, diluted with water, however you like it. Finding fresh nettles to buy is hit or miss, but the dried nettles are available in bulk (a much more economical option) year round at the many health food stores around town. If you’d like to harvest your own, now is the time. Nettles grow where there are high levels of nitrogen in the soil as well as rich moist environments. So look for them around old barns, by a river or a lake. The Huron River has nettles patches all over the banks, even in the parks. As usual, ask before picking. Stinging nettle, start harvesting now and until they are about two feet tall. The top 1/3 of the plant can be used. While I enjoy the extra thoughtfulness required for barehanded picking, most will use gloves. The stinging hairs won’t go deep, so simple gardening or cloth gloves work just fine. The plant isn’t harmed by being picked, as long as you are gentle (don’t pull it up by the roots) and just take the top 1/3 of the plant. That is the most tender and tasty portion, and also leaves the plant plenty to grow on. If a patch is picked regularly, the offshoots that come can continue to be picked for a month or more. But normally, once the wild plant is more than two feet tall or starts to flower (very small non showy white cascades), the season for enjoying fresh nettle is over. When I get home with a bag or two of nettles, I set some aside to eat that day or next and freeze the rest. I pick over the plant (bugs love them as well) and just dunk them in boiling water for a few seconds (the color will change to a brighter green) and then immediately put them in tofu tubs or plastic bags and into the freezer. In the end, the boiling water is also nutritious so I drink that, save it for soup stock the next day or two or freeze it as well for later use. You could also hang the nettles to dry, or spread them on a screen. Once they are totally dry, store in a tightly closed container out of direct light or heat. The nettles in this area are already eight inches or more, so this season appears to be two to three weeks early and may end quickly as well. I normally start harvesting mid May, but I’ve already enjoyed three meals that included steamed nettles. 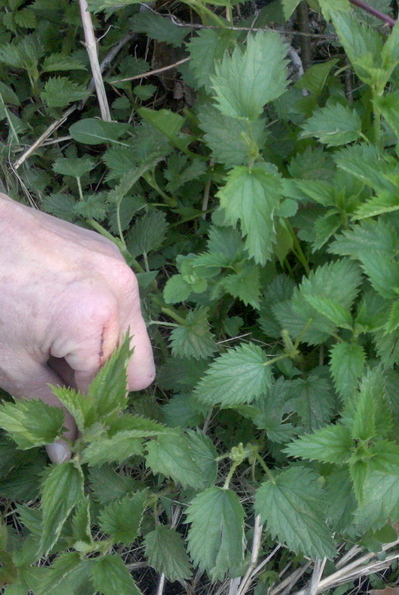 It is possible to transplant and enjoy nettles in your own yard, but don’t take that step without some planning. They spread easily. I’ve ended up with healthy happy plants in my garden, but that makes picking the produce around them a bit more hazardous. I’m doing a lot of transplanting this year, removing the early nettle plants to a less trafficked area. Linda Diane Feldt is a local Holistic Health Practitioner, writer, and teacher. Her cookbook Spinach and Beyond: Loving Life and Dark Green Leafy Vegetables is available at Crazy Wisdom Bookstore and Amazon.com. Nettles are just one of the wild greens included in the book. Follow her on twitter, or her Web site. Sat, Apr 30, 2011 : 2:37 a.m.
Linda, kath &amp; i just read your article-- great writing and cool subject! thanks for the tips, we'll be looking for nettles around town now.